COMMENTS:        This trigger occurred at longitude,latitude = 79.97,19.38 [deg]. with an error radius of 0.18 deg (90 % containment, statistical error only). This was 48 deg from the LAT boresight at the time of the trigger. The data from the Fermi-LAT show a significant increase in the event rate that is spatially and temporally correlated with the trigger with high significance. More than 30 photons above 100 MeV are observed within 100 seconds, with the highest-energy photons being 1 GeV events observed 2 seconds after the GBM trigger and consistent with the GBM brightest emission episode. The Fermi-LAT point of contact for this burst is Sylvain Guiriec ( sylvain.guiriec@nasa.gov). "At 19:49:03.50 UT on 09 July 2016, the Fermi Gamma-Ray Burst Monitor triggered and located GRB 160709A (trigger 489786547 / 160709826), which was also detected by the LAT (Guiriec et al. 2016, GCN 19675). The GBM on-ground location is consistent with the LAT position. The angle from the Fermi LAT boresight at the GBM trigger time is 48 degrees. The GBM light curve consists of two peaks with a duration (T90) of about 5.6 s (50-300 keV) beginning 64 ms before the trigger time. The time-averaged spectrum from T0-0.26 s to T0+0.83 s is best fit by a power law function with an exponential high-energy cutoff. The power law index is -0.43 +/- 0.04 and the cutoff energy, parameterized as Epeak, is 2211 +/- 131 keV. The event fluence (10-1000 keV) in this time interval is (3.33 +/- 0.09)E-06 erg/cm^2. The 1-sec peak photon flux measured starting from T0-0.06 s in the 10-1000 keV band is 6.5 +/- 0.3 ph/s/cm^2. The short/hard GRB 160709A (Fermi-LAT detection: Guiriec, et al., GCN Circ. 19675; Fermi-GBM detection: Jenke, GCN Circ. 19676) triggered Konus-Wind at T0=3D71345.896 s UT (19:49:05.896). The light curve shows a short, hard pulse with a total duration of ~0.4 s. The emission is seen up to ~8 MeV. As observed by Konus-Wind, the burst had a fluence of (1.5 =B1 0.3)x10^-5 erg/cm2 and a 16-ms peak energy flux, measured from T0, of (6.3 =B1 0.9)x10^-5 erg/cm2 (both in the 20 keV - 10 MeV energy range). The spectrum of the burst (measured from T0 to T0+0.256 s) is best fit in the 20 keV - 10 MeV range by a cutoff power-law (CPL) function with the following model parameters: the photon index alpha =3D -0.51(-0.17,+0.19), and the peak energy Ep =3D 2554(-509,+664) keV, chi2 =3D 40.1/50 dof. Fitting this spectrum with the GRB (Band) function yields the same alpha and Ep with only an upper limit on beta of -2.1, chi2 =3D 39.8/49 dof. MASTER II robotic telescope (MASTER-Net: http://observ.pereplet.ru) located in SAAO was pointed to the GRB160709.83 66 sec after notice time and 105 sec after trigger time at 2016-07-09 19:50:49 UT. On our first (20s exposure) set we no found OT within FERMI error-box (ra=15 12 59 dec=-29 48 00 r=4.32) brighter then 18.8. But this field do not included FERMI LAT error box (Guiriec et al., GCN 19675). 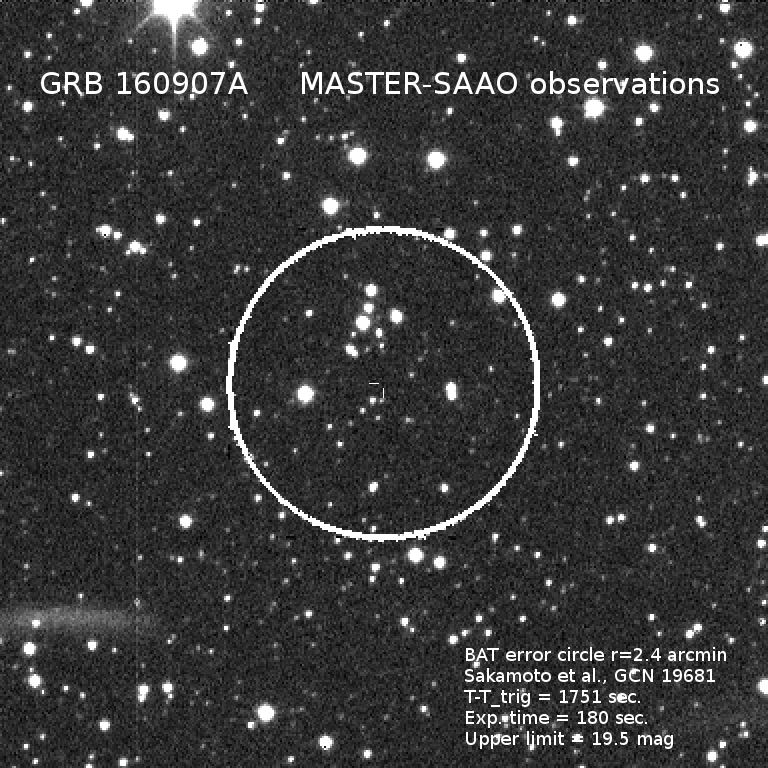 MASTER-SAAO robotic telescope located in SAAO was continue inspection of the GRB160709A and 1727 sec after FERMI GBM notice time (Jenke, GCN 19676) and before 9709 sec FERMI LAT notice time and 1750 sec after trigger time at 2016-07-09 20:18:14 UT observed FERI LAT error box. On our 120s exposure set we not found OT within FERMI LAT error-box (Guiriec et al., GCN 19675) brighter then 19.6. Swift-XRT has performed follow-up observations of the Fermi/LAT-detected burst GRB 160709A (Guiriec et al. GCN Circ. 19675) in a series of observations tiled on the sky. The total exposure time is 3.3 ks, distributed over 7 tiles; the maximum exposure at a single sky location was 1.4 ks. The data were collected between T0+20.7 ks and T0+39.1 ks, and are entirely in Photon Counting (PC) mode. No uncatalogued X-ray sources have been detected. The 3-sigma upper limit in the field (not including the regions where the tiles overlap) ranges from ~0.01 to ~0.06 ct s^-1, corresponding to a 0.3-10 keV observed flux of 4.3e-13 to 2.2e-12 erg cm^-2 s^-1 (assuming a typical GRB spectrum). Two previously-catalogued X-ray sources have been detected, however their status as catalogued objects makes them unlikely to be the afterglow. The results of the XRT-team automatic analysis of the tiled XRT observations, including a position-specific upper limit calculator, are available at http://www.swift.ac.uk/xrt_products/TILED_GRB00057. At 19:49:03.464 UT on 2016-07-09, BAT detected a count rate increase and a sub-threshold signal in the image. Due to the sub-threshold nature, this event did not trigger a normal burst event-by-event response. Using the data set from T-2 to T+8 sec from the recent telemetry downlink, the ground analysis found an 8.8 sigma detection in a 10-s image in 15-350 keV. As discussed below, this is likely the same burst, GRB160709A, that was detected by Fermi/GBM (Jenke et al. GCN Circ. 19676), Fermi/LAT (Guiriec et al. GCN Circ. 19675), and Konus-Wind (Frederiks et al. GCN Circ. 19677). Dec(J2000) = -28d 11' 18.2"
with an uncertainty of 2.4 arcmin, (radius, sys+stat, 90% containment). The partial coding was 19%. The mask-weighted light curve shows a multi-peaked structure that starts at ~T0 and peaks at ~T+0.8 s. The main pulses end at ~T+1 s, but there are some weak emissions that continue beyond the event data range. T90 (15-350 keV) estimated from the raw light curve is 4.8 +- 1.6 sec (estimated error including systematics). The time-averaged spectrum from T+0.0 to T+4.8 sec is best fit by a simple power-law model. The power law index of the time-averaged spectrum is 1.11 +- 0.28. The fluence in the 15-150 keV band is 4.5 +- 0.7 x 10^-7 erg/cm2. The 1-sec peak photon flux measured from T+0.30 sec in the 15-150 keV band is 2.7 +- 0.4 ph/cm2/sec. All the quoted errors are at the 90% confidence level. Using a 16-ms binned light curve, the lag of the initial pulse (~T0 to ~T+1 s) for the 100-350 keV to 25-50 keV bands is 3 (+/-5) ms (with 1-sigma error). Using a 4-ms binned light curve, the lag of the initial pulse for the same energy bands is 6 (+/-5) ms. These values are consistent with those from a short GRB. The detection time of this burst is only ~0.04 s from the Fermi/GBM trigger time of GRB160709A (Jenke et al., GCN Circ. 19676). Also, the burst structure is very similar to the one seen in the GBM. We thus believe the BAT detection is highly likely to be GRB160709A. However, we note that the BAT location is ~0.33 degrees from the LAT location and outside of the reported LAT error circle of 0.18 deg (statistical error only; Guiriec et al. GCN Circ. 19675). The large dispersion in the position measurements may be explained by the unknown systematic uncertainty in the LAT position. Nonetheless, we cannot rule out the possibility that these are independent events. The BAT location for this burst is covered by the XRT tiling search. No XRT or UVOT afterglows are found within the BAT error circle. MASTER-SAAO robotic telescope (2x4 square degrees twin telescope, http://observ.pereplet.ru) was pointing to the Swift-BAT error box (Sakamoto et al., GCN 19681) during Fermi-GBM alert inspection 1727 sec after FERMI GBM notice time (Jenke, GCN 19676) and before 9709 sec FERMI LAT notice time and 1750 sec after trigger time at 2016-07-09 20:18:14 UT. On our 180s exposure set we not found OT within Swift-BAT (Sakamoto et al., GCN 19681) brighter then 19.6. The inspection and references images are available at http://master.sai.msu.ru/static/GRB160709A_MASTER_SAAO.png . The short-duration GRB 160709A (Guiriec, et al., GCN circ. 19675; Jenke, et al., GCN circ. 19676; Frederiks, et al. GCN circ. 19677) triggered the CALET Gamma-ray Burst Monitor (CGBM) at 19:49:04.67 on 9 July 2016. No real time CGBM GCN notice was distributed about this trigger because the real time communication from the ISS was off (loss of signal) between 19:42 and 20:04. The burst signal was seen by all CGBM instruments. The light curve of the SGM shows a single starting at T-0.2 sec, peaking at T0-0.1 sec and ending at T+0.2 sec. The T90 duration measured by the SGM data is 0.38 +- 0.04 sec (600-3000 keV). Analysis of Astrosat data showed the CZTI detection of a short GRB 160709A (Fermi-LAT detection: Guiriec, et al., GCN Circ. 19675). The GRB occured at an angle of 124 degrees away from the CZTI pointing direction. The source was clearly detected in the 40-200 keV energy range. The light curve shows a single peak at 19:49:04.00 UT, 0.5 seconds after Fermi Trigger at 19:49:03.50 and a peak count rate of 1035.0 counts/sec above the background (four quadrants summed together), with a total of 3878.0 counts. The local mean background count rate was 314.0 counts/sec. Using cumulative rates, we measure a T90 of 0.45 sec, consistent with the Konus-Wind measurement of 0.4s (Frederiks et al., GCN Circ. 19677) and CALET (Asaoka et al., GCN Circ. 19701) but inconsistent with Swift-BAT (Sakamoto et al., GCN Circ. 19681) and Fermi (Jenke et al., GCN Circ. 19676).